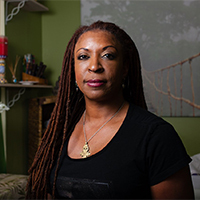 Felicia is the owner of Mystic Herbal Body Care and has been making Topical Cannabis products that have been stocked in 15 cannabis clubs in the bay area including Harborside Health Center. She also has one body care shop in the downtown area. Felicia has been a “Soap Crafter” for over 8 years. She is also a graduate from Oaksterdam University 2009 where she was inspired to create a line of topical cannabis products. Learn more about Felicia and her products here.